I love this time of year for one reason and one reason alone – coats and sunglasses. It’s like pink and orange, so wrong but it so very right. You just cannot argue with sunglasses and a coat. Call me shallow but I think it’s a very valid reason to love a season. When I was going out with my favourite ever boyfriend, we had a conversation about our favourite time of year and discovered we both loved autumn. I could see he thought we were a match made in seasonal heaven as he began to wax lyrical about the changing colours and nature’s beauty. ‘So why do you like autumn?’ he eventually asked. ‘Because it’s my birthday in October and I love wearing sunglasses with a coat’. He was a little bit taken aback as it began to dawn on him that I was not going to be his intellectual and philosophical equal but it was too late for him, he was in love and so I let him marry me so he could forever more enjoy my sunglasses/coat combos. So I’m back to work in my (very) little studio after a long summer break. It’s time to make myself a winter coat. I’m very excited about the one I’m currently working on; two words – snakeskin and boiled wool. That’s three but enough said – I’ll share it when I’m finished. In the meantime, I did start a coat last February which I finally managed to finish in May, just in time for the summer. Practical. I got about three minutes wear out of it before it had to be packed away for the summer. But those three minutes took place in Amsterdam which is actually further north than Haslemere and therefore much colder – coat time! All joking aside, I was glad I brought it because it was freezing and my sunglasses would have looked completely inappropriate with anything other than tweed. 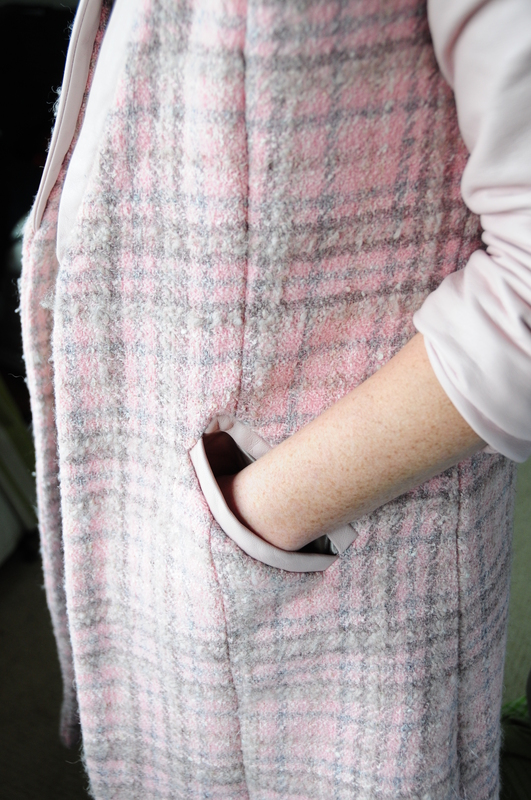 This coat was compiled of pink tweed and pale pink leather. I’m not normally a pale pink wearer but my friend Narn McMoo (actually almost her real name) bought 5m of pink tweed and 5m of coral tweed in an auction in 1994 and after twenty years finally realised she was never going to use them so released them into my hot little hands. 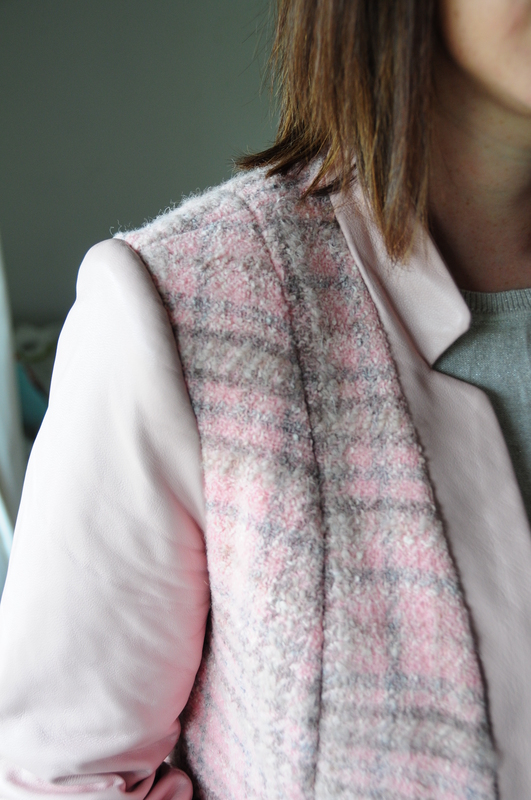 The coral still awaits inspiration but I decided to go for it with the pink tweed and see where it led me. My main concern was crossing the fine line between fashion and confectionery but I think the marshmallow look has been narrowly avoided and I’m pleased with the result. I’ve discovered, through less than satisfactory projects in the past, that tweed (or any loose weave fabric) like this always looks better when it’s interfaced. It means taking a little bit longer to prepare the fabric before sewing but it makes a world of difference in the final result. This coat has been interlined with fusible cotton but I’ve used ordinary cotton and lining fabric tacked on to create the same effect, although it takes a LOT longer. As a final note, I must offer much respect to the people of Amsterdam who ride these bikes like it is the easiest thing in the world. They hold umbrellas, text, comb their hair etcetera, all while riding their bikes around the city – sometimes all at the same time but I can tell you from personal experience that it’s very hard. 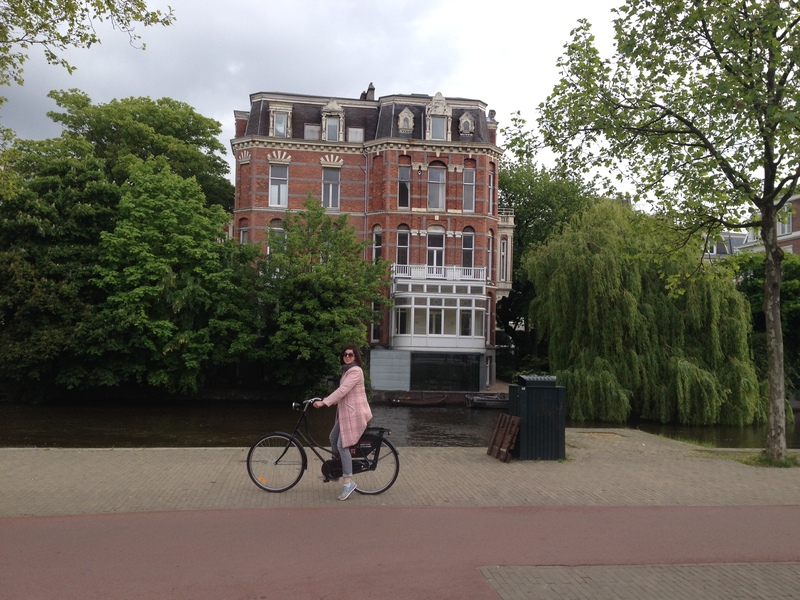 Those bicycles are huge, there are no brakes so you have to peddle them backwards to stop and when you want to go, you accidentally stop because you are trying to get your peddle into a ‘go’ position and then you fall off. All at every junction of the amazingly laid out cycle path system that is everywhere in the city. I nearly ended up in the canal more than once but, thankfully, I lived to sew another coat.